A column in The Australian over the weekend argued that mums and dads should think about selling their fully franked bank Tier 1 hybrids to buy unfranked Tier 2 subordinated bonds. 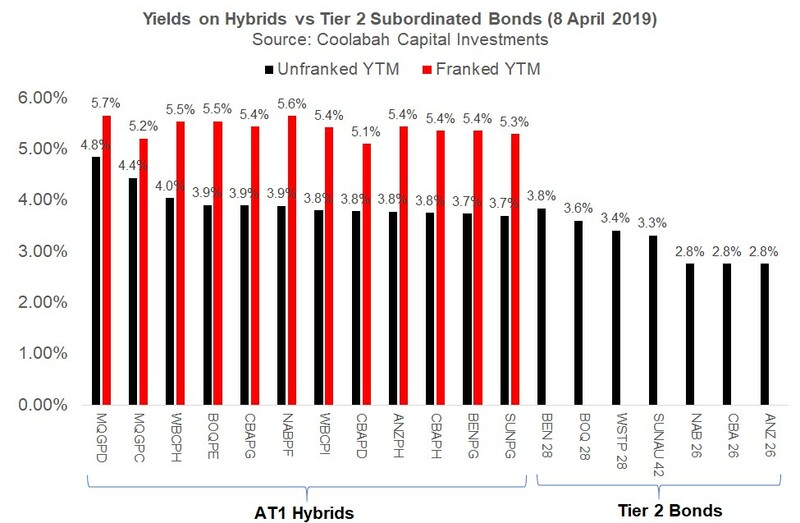 But this analysis is flawed on many bases, the most obvious of which is that the unfranked cash yields on numerous major and regional bank Tier 1 hybrids are, in fact, significantly superior to the cash yields on Tier 2 subordinated bonds, as our chart below shows. On an unfranked basis today, you can capture cash yields of between 4.0% to 4.8% pa (eg, WBCPH and MQGPD) before any franking, which comfortably trumps the best Tier 2 bond yields, which are between 3.3% and 3.8% pa. For the circa 92% of taxpayers who pay tax and are not going to be affected by the inability to claim cash refunds under a Labor government, the best franked yields on regional and major bank Tier 1 hybrids of between 5.1% to 5.7% pa are around 1.5x larger than the yield one can get on Tier 2 (see chart). As a definitional point, Additional Tier 1 capital hybrids rank ahead of bank equities in the capital structure but behind Tier 2 subordinated bonds. Both contain a bail-in clause that allows APRA to convert these securities into equity if it declares that a bank has become non-viable. Tier 1 hybrids also automatically convert into equity if a bank's common equity capital ratio falls to 5.125% (or less than half current major bank equity ratios). There are some further nuances as to why one may prefer Tier 1 hybrids over Tier 2. First, APRA currently has a policy proposal out there that could (in theory) more than triple the amount of Tier 2 bonds that the major banks issue (from circa 2% of their risk-weighted assets (RWA) to 6% to 7% of RWA), which would be very negative for Tier 2 bond prices. Our research estimates that Aussie dollar Tier 2 credit spreads gapped about 33 basis points (bps) wider after the APRA paper was published in November last year, even once we removed the impact of the overall market beta at the time (ie, absolute spread moves were significantly higher). In price terms, the APRA report reduced the value of a 5 year Tier 2 bond by about 1.5%. But this move has now largely reversed (ie, Tier 2 spreads have normalised) on the market’s presumption that APRA will not force the banks to issue up to $125 billion of expensive Tier 2, and will instead embrace a lower cost and more liquid non-preferred senior, or Tier 3, bond solution, which has become the best practice overseas. If APRA shocks market participants by sticking to its original Tier 2 proposal, spreads would likely once again blow wider, which implies that there is still nontrivial downside risk for the sector. In contrast, the ALP's proposal to eliminate non-taxpayers claiming cash refunds on their franking credits is almost certainly fully priced into ASX hybrid spreads, which are now 60-70bps wider than they were prior to the ALP’s announcement in early 2018. This was because affected investors have had more than 12 months to adjust their portfolios if they think they need to (and the ability to in-specie transfer your direct hybrids to a super fund that will still let you use the franking credits suggests many may have made a mistake by exiting the sector). Prior to the announcement, 5 year major bank hybrids were paying about 3% over bank bills (or 4.75% pa in today's terms) whereas now they are paying circa 5.35% pa. The fact that we have had 4 large bank hybrid issues (CBA, Westpac, NAB and Macquarie) since November 2018, raising about $6 billion in hybrid capital suggests that the market is comfortable owning these securities at the current spread levels assuming an ALP victory. I recently quoted the Unisuper's CIO, John Pearce, in my AFR column, who said he had invested $300m in the latest NAB hybrid, NABPF, because he thought it was very cheap at a spread of 4% over bank bills (or a total franked yield of 5.75% pa), and that the market had "overreacted" to the ALP policy. But even if you (1) completely ignore the potentially bigger downside risks for Tier 2, (2) ignore the fact you are picking up 0.60% pa in extra income compared to before the ALP announcement, (3) assume the ALP wins, (4) assume that the Senate does not block their franking proposal, (5) assume you are a non-taxpayer, and (6) assume you do not in-specie transfer your hybrids to a retail super fund that will give you the benefit of the franking credits (because of the pooling benefits of other taxpayers in the super fund) and, as a result of (2) to (6), you conclude that you cannot access any cash refunds, the unfranked cash yields on many ASX hybrids are, as we noted above, still superior to most major and regional bank Tier 2 bonds. With the federal election looming, there are a lot of folks keen to offer unsolicited advice to consumers to sell out of certain investments that may or may not be affected by potential government policies to buy other assets that could, in fact, be inferior solutions on a risk, liquidity and return basis. As Paul Heath, the CEO of Koda, notes in the AFR today, a lot of this advice is conflicted by enormous 1% to 3% sales commissions product manufacturers are paying people to push listed investment companies (LICs) and listed investment trusts (LITs) that are exempted from the Future of Financial Advice (FOFA) laws that otherwise prohibit fund managers paying conflicted commissions to people advising retail punters. If someone is advising you to sell assets to buy an LIC or LIT, it pays to question whether they are receiving a financial benefit from you acting on it. I suspect many are. For the avoidance of doubt, all the portfolios I run are absolute return, and allow us to go to a 100% cash weight if we cannot quantitatively identify any mispricings to capitalise on. This includes the BetaShares Active Hybrid ETF product that we manage, which can shift to a 100% to cash and bond weight if we find better value in those sectors (ie, have no hybrid exposure at all). As a share of our overall FUM, Tier 1 hybrids are a very small exposure currently, and there have been periods, like in late 2014, when we had no holdings at all because spreads were incredibly tight. Disclaimer: This information has been prepared by Smarter Money Investments Pty Ltd. It is general information only and is not intended to provide you with financial advice. You should not rely on any information herein in making any investment decisions. Smarter Money Investments Pty Ltd is authorised representative #000414337 of Coolabah Capital Institutional Investments Pty Ltd that holds Australian Financial Services Licence No. 482238 and authorised representative #414337 of ExchangeIQ Advisory Group Pty Limited that holds Australian Financial Services Licence No. 255016. I think there is a bit of confusion here. MQG hybrids are issued by Macquarie Group Limited and are used primarily to fund their non -banking subsidiaries and shouldn't be considered to be banking hybrids. MBL hybrids (such as MBLPA) are issued by Macquarie Bank Limited and provide funding to the banking division. Macquarie Bank has a higher credit rating than Macquarie Group and the current YTM on the MBLPA at 3.87% is commensurately lower than the MQG hybrids.